This is how it all began. Innocently enough. New sewing machine, new baby. 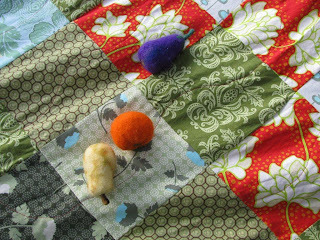 Make baby quilt. Except then a great quilting beast was unleashed. Then I found out about fabric online. Now I am helpless in the spell. These are terrible quality photos, but that's what I have. I was talking to Julie M. yesterday and she told me about your blog. You're amazingly productive! Julie thought you might like to know about the quilt guild I'm starting. It's called the Vancouver Modern Quilt Guild and you can learn more about us here: http://vancouvermodernquiltguild.ning.com/. We're all about connecting non-traditional, fresh, modern quilters and providing inspiration!